If you didn’t know already, back in March we made all of our premium or personalized Touring Plans accessible via our Disney Mobile App, Lines. Now, we’re making it easy for you to track your progress as you tour! 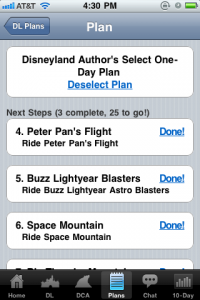 Simply fire up Lines, find the premium or personalized Disney World Touring Plan or Disneyland Touring Plan you’d like to use, and click “Select Plan” at the top. As you complete each step in the plan, click on “Done!” on the right-hand side of each step. The number you’ve completed and the number of steps left will update at the top, and the steps that you’ve completed will move to the bottom of the plan. If you make a mistake, you can scroll to the bottom and click on “Undo” to move the step back to the main section. Note: for now, tracking your progress requires an internet connection. 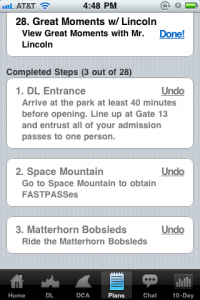 We hope this helps you more easily follow a Touring Plan while in the parks! Let us know what you think! Great news! 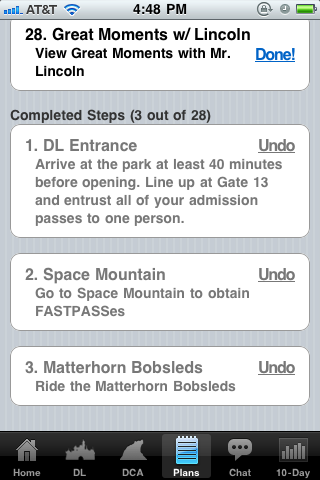 I’ve always enjoyed “keeping score” of how many attractions we’ve been able to do in a single day. Thanks Henry. Love that this is so easy to do! Can’t wait to use this in two weeks! Do you have a setting for those trying to complete and ultimate? That would be super handy. The clipboard got a little cumbersome last time. The Ultimate Touring Plans can be used with this new progress-tracking feature. Note, however, that the Ultimate Touring Plans include only the “core” attractions. That should be fine for keeping track of whether you’ve finished, but it would not reflect any bonus attractions if you’re aiming for a killer attraction count. We kind of wing it, but it will be nice to see what we did and didn’t do for our second day back at a park. I think we would pick the Ultimate so that we can see all attractions even though we may skip some. Nice feature! I kept thinking that would be handy on the last trip. Next up, Windows Phone Mango app? 😉 Am I beating a dead horse yet? Do you have to be online to use the plan or can we download it on an Ipod Touch? What do you mean by Internet connection? Do I have to be in a wifi zone? Or does the 3G on my phone work? Confused because the photos show wifi being used on this iPhone. Love that I can share this with visitors and clients. Even the “non-planners” enjoy a plan once in awhile.